Living with a hernia is possible as long as you know the severity of your condition and you know the extent of the danger. If you can push back the bulge, then you don’t have to undergo any surgical procedure. You can still live with it with manageable lifestyle. However, if the bulge is hard and it gets harder every time (and you definitely can’t push it back), then you need to plan a surgery because this type of hernia can endanger your life. Hernia is a bulge that is happening under the skin resulted from a tear on the abdomen layer, causing a part of your digestive system to protrude out. Imagine an old and worn tire, and imagine the inner tube that protrudes out through a hole or tear on the exterior surface. That’s the same thing when you have a hernia. Basically, your muscles help you with your busy activities and stuff. Not to mention that they also help you to put your organs, tissues, and overall systems within the correct spot. However, as you get older, these muscles tend to lose their elasticity. And your worn and old body may not be able to hold it up. If there is a tear or a hole on the skin layer (usually on the underneath top skin), it is possible for the organ or the tissue will squeeze itself out. And that’s how hernia happens. It is basically not dangerous as long as you can push the bulge back again. When you can’t, it means that your hernia has become stuck and it is possible that the bulge will harden over time. During the process of becoming hard, it will obstruct your system and your bodily function. Not to mention that you may experience pain and discomfort that will get worse from time to time. You don’t want that to happen to you, do you? 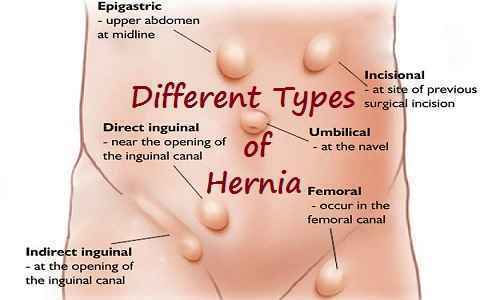 There are different types of hernia, depending on the location where the bulge takes place. Because of the place, some hernias are considered ‘safe’ while the others are risky. Groin hernia, which can be divided into two other types: femoral and inguinal. The inguinal is the common one. When there is a weakness on the lower belly area and some parts of the intestine pushes through it, then you have the inguinal groin hernia. Indirect inguinal groin hernia means that the hernia enters the specialized inguinal canal whereas the direct type doesn’t enter the canal. It happens mostly because people lift heavy objects. In femoral groin hernia, the lump is located in the femoral canal – usually on the upper thigh. Umbilical hernia. This happens close to the belly button and most common in babies. It is basically harmless because it is a fat that pushes through the belly button muscles. This kind of hernia doesn’t cause or lead to other issues. Incisional hernia usually happens to people who have undergone surgeries where the surgical would doesn’t heal properly and totally. It can cause other issues if not treated correctly. There are still other types of hernia, such as hiatal or epigastric hernia. As long as you know the types and you know how to manage it right, living with a hernia is possible and manageable.